Bobby Robson: More than a Manager is an extraordinary compilation of Robson archive footage interspersed with A-list interviews of coaches and players he influenced. Before this film, I didn’t know who Robson was, but in his prime is so alive and captivating that I could have watched him for another 2 hours. It is only towards the end, when he finally succumbs to cancer, that I realized he is literally communicating from the grave. Bobby Robson took England to WC 1986 where they lost in the Quarters to Maradona’s Hand of God, and to the Semis at WC 1990, where they lost in penalties to Germany. Before the WC Italia semi-final, Robson inspired his England team by telling them that after this game, they will be immortal. But by capturing this moment on film, it is really Robson who becomes immortal to any coach who watches this film. England did not reach the semi-final again, until 20 years later under Gareth Southgate at WC 2018. 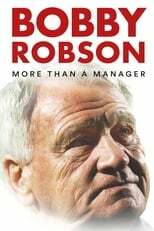 According to an interview with Writer-Director Gabriel Clarke, Robson is also the last English manager to win a European trophy. (I couldn’t confirm this, but I think it was the 1996-97 UEFA Cup Winners Cup with Barcelona.) The idea was intriguing, and with a little searching, it learned that few big name English managers coach in Europe. As others have famously pointed out, it would be like playing in a foreign country! But after Brexit, I assume the number will fall to absolute zero. Robson endured many struggles. 15 years fighting cancer. 36 years in a career where journalists ride your back and club boards can’t be trusted. Robson was the first English manager to be lampooned by the media, who christened him Bumbling Bobby. Several times, a team’s inspired performance saved his job just as the axe was about to fall. What was difficult for me to accept with this film — and it is why I don’t rate it very highly — is that it jumps back and forth in time. To help you navigate, the film has a little calendar in the top right corner, but constantly scrambling the chronology was just too much cognitive load for my addled brain. Clarke seems to center on Hobson’s time with Barcelona and then link everything back and forth from there, even though Robson only managed the club for one year. I felt he used Barça to aggrandize Hobson’s link to Jose Mourinho and Pep Guardiola, as they were probably the most important coaches on the planet at the time of filming. Even the title of the film is a bit presumptuous, playing off Barcelona’s tagline of being “More than a Club”. Director Clarke conducted many interviews for his film; the A-listers include Alex Ferguson, Jose Mourinho, Pep Guardiola, Paul Gascoigne, Gary Linneker, Alan Shearer, and Brazilian great Ronaldo Luís Nazário de Lima (the Original Ronaldo). It was sad to see Gascoigne in such a ravaged state, where he looks 25 years older than his age of 50. And the good life has made Ronaldo somewhat unrecognizable. But nevertheless, all of the interviews add luster and shine to the film. It was fascinating to see José Mourinho in so much of the archive video. Initially hired in Portugal as a translator with coaching background, Mourinho assisted Robson for 5 years, staying behind when Robson left Barcelona. In looking at the records, I discovered that most of Robson’s highest win percentages were when Mourinho was his assistant in Portugal and Spain. Several articles I read described their partnership as Robson being more the motivator while Mourinho was more the planner and tactician. From Mourinho’s coaching accomplishments, it appears that he is indeed a Special One, and I look forward to when someone does a documentary on him similar to this one. Right now there is a Mourinho film on Amazon Prime, but it is quite horrible and appears to have boot-legged content, so ignore it. In conclusion, while I don’t rate this film too well because of the confusing time-shifting, I ended up really wishing I could spend more time with Bobby Robson. So I bought his autobiography.